My good friend Ms.J gave us a box of Ritz Snowflake crackers the other day. I though it was cute and came in handy today since I wanted to make a quick and easy lunch. I need to shop around for a new microwave since ours went kaput last night. Snowflakes shaped colby jack cheese. Organic apple sauce in MiniDippers. Pepperoni slices, seedless black grapes. 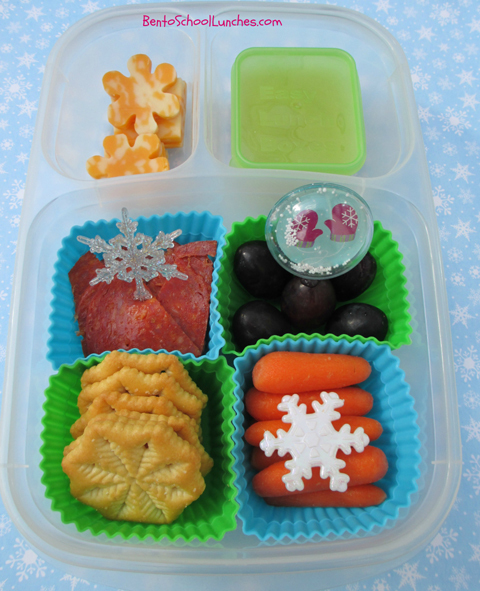 Ritz Snowflakes crackers, organic baby carrots and some cute winter picks added a finishing touch. Packed in an EasyLunchBoxes container. Ooooh i really love that snowglobe pick! And those snowflake crackers! Wish it was sold in stores here too! Thank you very much bentodays! You can also find those picks at http://www.bentomamasupplies.blogspot.com besides Amazon. Love all the snowflakes! Thanks for linking up at today's Switch It Up Sandwich Linky!